PTC’s user conference in Boston last week (LiveWorx17 ) covered a lot of ground — everything from Creo to Windchill to augmented reality (AR), but the focus of the event was PTC announcing the launch of its newest version of ThingWorx Industrial Internet of Things (IoT) platform – ThingWorx 8. According to the company, with this update, ThingWorx evolves into a more robust, comprehensive industrial IoT (IIoT) technology offering. PTC also announced a new lineup of ThingWorx-powered apps for the manufacturing environment, as well as ThingWorx Studio support for native authoring and publishing of AR experiences for Microsoft HoloLens. Interestingly, PTC’s VP of Corporate Communications, Jack McAvoy said that two of this year’s three main messages for LiveWorx17 revolved around ThingWorx as more than a platform and the evolving ThingWorx ecosystem through physical/digital convergence. PTC’s foray into IoT got a big boost about four years ago when it acquired ThingWorx, creators of a platform for building and running applications for the Internet of Things (IoT), for about $112 million. The acquisition of ThingWorx immediately positioned PTC as a major player in the emerging Internet of Things era. According to a research report, Disruptive technologies: Advances that will transform life, business, and the global economy from the McKinsey Global Institute, the Internet of Things has the potential to create economic impact of $2.7 trillion to $6.2 trillion annually by 2025. The firm believes perhaps 80 to 100 percent of all manufacturing could be using Internet of Things applications by then, leading to potential economic impact of $900 billion to $2.3 trillion, largely from productivity gains. For example, with increasingly sophisticated Internet of Things technologies becoming available, companies can not only track the flow of products or keep track of physical assets, but they can also manage the performance of individual machines and systems. Most large PLM companies deal with three groups of people that are necessary for survival – employees, customers, and investors. Every company regards and treats the three groups differently, but most of the successful ones acknowledge the importance of all three – although some companies are better at it than others and some companies regard one or more of the groups as necessary evils. Each of the groups gets the information it needs to make decisions from different sources, such as press releases, news feeds, whitepapers, eBooks, financial reports, and so on. Financial reports for tech companies are especially interesting not only because of what they say, but what they might imply. And, while some companies try to report “alternative facts,” financial figures don’t lie, and some things are obvious, but there are always numbers subject to speculative interpretation. That brings me to PTC’s most recent financial report that was made public last week. There were some surprises, some good, some not so good, but in many ways reinforced and reflected the direction of the company, namely IoT. Admittedly, IoT was not the biggest source of revenue for PTC, but it’t clear that it is increasingly important to the health and wealth of the company. I read a lot of books, mostly non-fiction and technical in both hardcopy and digital formats. Although I get through most of them, there are some I don’t even try to finish, and a few become favorites that I keep for future reading and reference. 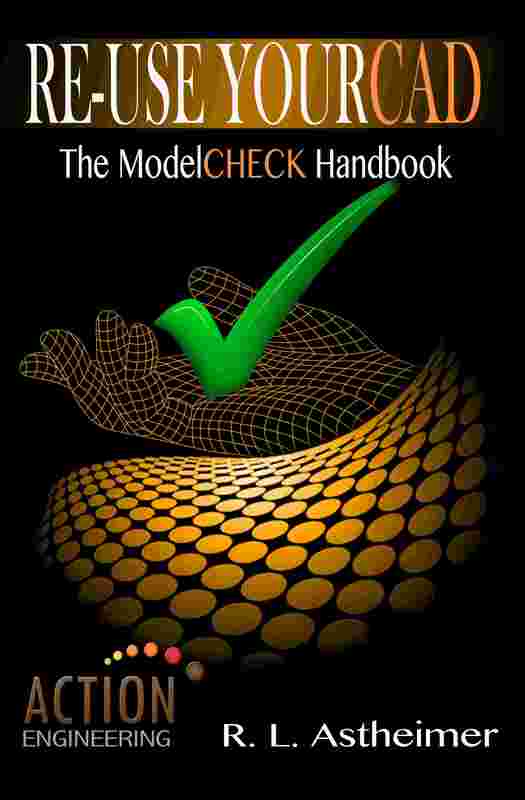 I recently read a book entitled Re-Use Your CAD: The ModelCHECK Handbook by Rosemary Astheimer. When I saw Handbook in the title, I thought it would be another dry reference book, but I was pleasantly surprised that it was much more than that — it’s a good learning and reference resource. The book’s author, Rosemary L. Astheimer, is an application engineer for Action Engineering, as well as a Continuing Lecturer for the Polytechnic Institute at Purdue University. She received her BS in Mechanical Engineering from the University of Massachusetts in Amherst and her Masters of Software Engineering from Brandeis University. Before joining the faculty in 2014, Ms. Astheimer spent over 15 years working in the CAD software industry. She began her career in software support, transitioned into a pre-sales application engineer focusing on business development of new products and was most recently a product manager. I first met and interviewed Ms. Astheimer at PTC’s LiveWorx 2016 in Boston. She knows her stuff. What a difference a few days make. Last week I was in Denver teaching math to middle schoolers and this week I was in Boston with about 4,000 others attending PTC’s LiveWorx 16. The spotlight at the conference shone on the Internet of Things (IoT) and PTC’s commitment to it. So, you think that the Internet of Things (IoT) thing is still just a fad? Based on my experience at PTC’s LiveWorx 16 in Boston this week, IoT is becoming an increasingly big part of the future – not only for PTC, but for all of us. Still not convinced? Just the attendance figures alone from this year over the past couple might help convince you – LiveWorx 2014 (~350 attendees); LiveWorx 2015 (~2,300 attendees); LiveWorx 16 (~4,000 attendees). Attendance numbers don’t lie and that shows the growing interest in IoT. About a month ago I spent a few days in Boston at PTC’s LiveWorx 2015 event. It was an eye opener for me and a brief look into the future of PTC with its growing emphasis and dependence on the Internet of Things (IoT). Recaps of the event, entitled LiveWorx 2015: PTC Drives Home Its IoT Future – Part 1 and PTC ThingWorx Converges On IoT were published shortly after the event last month. Beyond the technologies and business strategies presented, what struck me was the relatively young crowd attending with relatively young PTC PR people pushing the IoT platform. Sold out with over 2,300 attendees (up from ~350 in 2014), the draw was similar or maybe more than this year’s PTC Live Global user event. Although Creo and Windchill were certainly present at LiveWorx, they took a back seat to IoT offerings, such as ThingWorx, Axeda, and others. So what does IoT really mean? I don’t know either because it’s evolving so rapidly and all participating vendors define it so that it accommodates what they offer best. In other words, until standards are established, the definition continues to evolve. I will admit, however, that PTC currently has a leg up on virtually all of the competition for IoT in its traditional design, engineering, and manufacturing space. A standard definition is in the works, however, and IoT generally refers to uniquely identifiable objects and their virtual representations in an Internet-like structure. The term Internet of Things was proposed by Kevin Ashton in 1999, although the concept has been discussed since 1991, so it’s not exactly brand new. According to PTC, the Internet of Things has the potential to create trillions of dollars of new economic value in the coming decade. To capture this value, manufacturers will rely on new applications that enable the creation of smart, connected products, thus PTC’s interest and commitment, as shown in the brief video below. So, you think that the Internet of Things (IoT) is a fad? Based on my experience at PTC’s LiveWorx 2015 in Boston this week, IoT is a big part of the future, not only for PTC, but for all of us. Still not convinced? Just the attendance figures alone from this year over last might help convince you – LiveWorx 2014 (~350 attendees); LiveWorx 2015 (>2,300 attendees). Numbers don’t lie and that shows the growing interest in IoT. Along with about 1,900 attendees, we just returned this week from the 2013 edition of the PTC Live Global conference and exhibition in Anaheim, CA. We saw and heard several interesting things from PTC employees, partners, and customers. Let’s start off on Day 1. After a short introduction, PTC’s president and CEO, Jim Heppelmann took the stage with the song “Iron Man” by Black Sabbath blasting. What’s that about? The early focus of his address was the focus of not only PTC, but just about every other software vendor – mobility. This dramatic change of tune comes just a couple of years after Heppelmann derided the notion of software as a service and cloud computing as nothing more than “vapor.” Today, mobility to PTC, according to Heppelmann, consists of products being delivered as a service, with the line blurred between product and service. Click on this link to view Jim Hepplemann’s keynote address at the PTC Live Global event. He then introduced the concept of reverse innovation to accommodate different unique requirements for different customers. Interesting concept, but I need to get more details on exactly what this means. He went on to say that for products in general, value is shifting away from hardware to software, especially embedded software. Increasingly, products are defined, upgraded, and updated via software. Traditional hardware manufacturers are beginning to employ more software engineers than mechanical engineers. As handy as these software innovations might seem, do they offer too many choices and ultimately frustrate customers and drive up costs? The verdict on this remains to be seen, but I tend to say, “yes,” too many choices can be overwhelming, especially for products that are meant to be simple. What he was getting at, though, is that increasing numbers of CPUs and software mean “smart” products connected to the Internet. In other words, an “Internet of things,” thanks largely to increasing connectivity. With 10 Creo apps currently available, and although the next release of Creo (3.0) won’t be available until early next year (Q1? ), a few hints were given about what it might look like. Think scalability and interoperability – more on that later, though. PTC says that today, one in four Pro/ENGINEER users has upgraded to Creo, but sees adoption rate at 50% uptake by the end of this year. That seems just a bit optimistic, but potentially doable. I’ve just begun with the highest of highlights about the conference and the future as PTC sees it. Over the few weeks I’ll discuss some of the most significant announcements coming out of PTC’s user conference with regard to new products/technologies, corporate direction, and customers’ reactions. From what I witnessed this week, PTC’s future looks brighter than it has for quite some time. Rendering has entered the mainstream of the product development process with this capability being part of many CAD applications. However, there is still plenty of room for specialized products that optimize rendering and take it to a higher level. One of our favorites is Keyshot from Luxion, who just announced KeyShot 4, the next generation of its rendering and animation package. Luxion continues to develop its rendering technology to bring speed and improvements to KeyShot, making it an integral part of the product development process, from concept through sales and marketing. KeyShot 4 adds new approaches to features and improved rendering enhancements that make KeyShot an accurate 3D rendering animation system for the product visual workflow. The new “Live Linking'”capability lets Creo, SolidWorks, and Rhinoceros users maintain all part and feature updates made to their models without having to redo any of their work inside KeyShot. This capability requires a separate plugin that is available free of charge from the KeyShot website. Keyshot 4 introduces a new method for applying physical lights, with the ability to turn any object in the scene into a point, area, or light source. Improved import options give you more flexibility when importing 3D geometry and the ability to work with the actual units of CAD software. More material options come courtesy of a new partnership with Mold-tech, introducing accurate representations of Mold-Tech textures. Improved algorithms provide more realism for subsurface light scattering within translucent materials. KeyShot Pro users now have the ability to apply render layers to objects and create Model or View Sets to explore different configurations of product appearances, camera views, and environments. Pro users will also experience enhanced HDR editing capability with dynamic environment highlighting and options to tilt and blur HDRI’s. The KeyShot user interface now has the ability to dock project, library, and animation windows. Optionally, models can now be viewed in full stereoscopic 3D on supported 3D monitors. Increased control over the model and environment is provided with the ability to apply rounded edges to sharp corners, multi-select objects in the real-time window and create ground planes. Speeding the time it takes to add detail to 3D geometry and reducing the files size of imported models has been addressed with the new Rounded edge feature. With this option, you can apply a small radius to sharp edges creating a more realistic look. This option is a a visual enhancement to the rendered graphics without increasing file size or render times. KeyShot 4 pricing starts at $995. As with previous versions, animation capabilities can be added to KeyShot 4 for $500 and interactive KeyShotVR capabilities can be added for $1000. We have watched Keyshot evolve and mature as one of the best rendering packages in the marketplace, regardless of price, and Keyshot 4 continues this positive evolution.